Computer games essentially fall into one of two categories. There are those that aim to let their users escape from reality, and there are those that try to replicate it. Both forms of title vary significantly in everything from aesthetics to mechanics and, as a result, require entirely different qualities in their respective developers. With regard to the “escapism” games, it’s the artistic creativity and imagination of the responsible teams which are paramount in enabling them to create something far-removed from the banality of everyday life. On the other side of the fence, the folks behind the “simulation” group must possess the attention to detail to authentically capture the intricacies of genuine experiences. The appeal is that, often, these titles place users into a pair of shoes which are simply unavailable to them in everyday life i.e. rally car driving or government espionage work. And so, without further ado, we turn our attention to Premier Manager 2012, a PSN mini which places joypad holders in a position countless have dreamt of holding – standing in a dugout, presiding over the fortunes of a group of 11 young men chasing a spherical piece of leather round some closely-cut pasture. 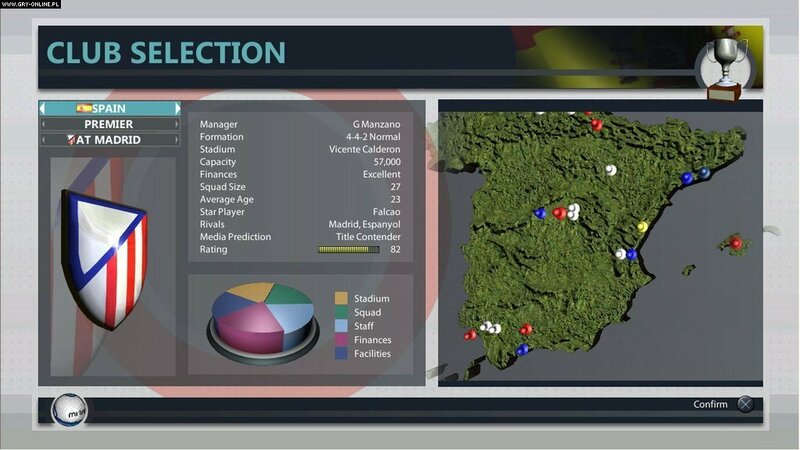 There are two key questions that need answering: firstly, how well does PM 2012 simulate the challenge of modern-day football management, and secondly, when alternative games are affording players the opportunity to battle terrorism/drive super cars, can pouring over statistics and trying to influence matters from the sidelines actually cut it with modern gamers? The good news is that most of the variables that pre-occupy the likes of Harry Redknapp and Arsene Wenger are present here. There’s obviously a transfer kitty to play with (the size of which depends on whether or not a Russian billionaire is lurking in the background at your particular club), a range of formations to select and a group of staff to share some of your responsibilities with. The breadth of options is impressive and when you’re not tasking scouts to look for a particular type of player in a specific league or tinkering with training programmes to focus individuals on certain key skills, you can even invest in better medical facilities to shorten the length of time your brittle-boned wingers spend out of action. Obviously, such is the level of investment and size/quality of squads at many Premier League clubs today that managing egos has become a real minefield for coaches like Roberto Mancini and Alex Ferguson. PM 2012 does a good job of reflecting this in its gameplay. Leave a player out of the match-day squad too many times and before long he’ll be knocking on your office door to let you know his thoughts on the matter. As a result, his morale will drop and the risk is, even if you do restore him to the first 11, will his performances be up to scratch? It’s just one element in the delicate balancing act you’ll need to perform if you want to be successful. The menus and interface are quite cleverly implemented in a style akin to the PS3’s own setup. Having said that, the button configuration does take a bit of getting used to and is clearly not as intuitive as the mouse and keyboard combo of the Championship Manager or Football Manager games. Sadly, the music that accompanies the experience is hideously repetitive. Quite why the people at Urbanscan felt the need to use the same “sub-disco” tripe that’s plagued sports-sims for years as background ambience defies belief. Perhaps they felt including a spot of contemporary Indie or HipHop might prove such a distraction that some gamers could end up employing their reserve goalkeeper in an auxiliary striking role; who knows? Unfortunately, music is the least of PM’s problems. Of far greater concern is the fact that, essentially, you’re having to manage a team in the dark. The simplistic graphical representation of the action is, frankly, unusable (with the fast speed there’s a danger of epileptic seizure and on the lower setting falling asleep is the likely outcome). As a result, you are forced to skip between a screen of player scores and one with a small selection of stats (shots, possession percentage, successful passing etc). Yes, you can see when a player takes a shot (and whether it’s on target or not) and when somebody gets booked, but without any text commentary there’s no real way of knowing how things are truly panning out. Are your wingers managing to beat their full-backs? Is your striker finding space in the box? Was that goal a close-range header or 30-yard screamer? At the end of the day, you can’t make informed tactical decisions without information. On top of this, some of the variables simply do not impact proceedings as much as they should. When the Champions League group stages are on and players are playing twice a week, fatigue should be a definite factor. It isn’t. When a player has been out for months with injury, getting his match sharpness back should take time. It doesn’t. When Nicholas Bendtner is up front, goals should be hard to come by. They aren’t. The problem is that by the time you’ve combined these (and several other) factors, PM 2012 loses a lot of its credibility as a genuine simulation. Perhaps the worst crime I witnessed in this regard, was after guiding Arsenal to third place in the league. In the subsequent contract negotiations I greedily demanded too much money from the chairman and was promptly dismissed. To be then recruited by Manchester City (the side who’d left me for dead in the previous year’s title race) was nothing short of farcical and shattered any belief I had in the game’s authenticity. Without wishing to kick a game while it’s down, there are still a few more flies in the ointment that need to be exposed. Some are only minor, like the Unity screen (a clever feature designed to show how well players will work with the current tactics, positions etc.) being inversed for no apparent reason, or the game not allowing you to see a player’s current match rating on the screen where you make the substitutions. Others are far more worrying, like the fact that you don’t have to adapt your style to different opponents, regardless of their quality or approach. 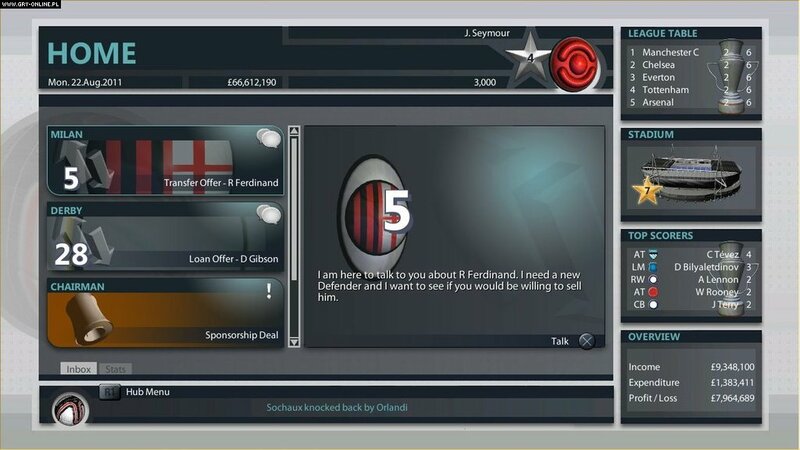 In answer to the first question then, no, Premier Manager 2012 does not do a great job of simulating the stress-filled life of football management. The ironic thing is that, despite all the shortcomings, the game can still be highly immersive. Without doubt, there will be times when you find yourself sat on the edge of your seat, longing for a last minute equaliser or screaming at the TV in a futile bid to urge your men to get forward to win a tricky cup tie. There are also plenty of moments which give a real sense of satisfaction (like when one of your substitutions steps off the bench to save the day), but these just serve to make PM 2012 all the more frustrating. The answer to our second question is yes, there definitely is still a place for football manager sims. But if they are going to capture the current generation’s minds they’ll have to be executed a great deal better than this.